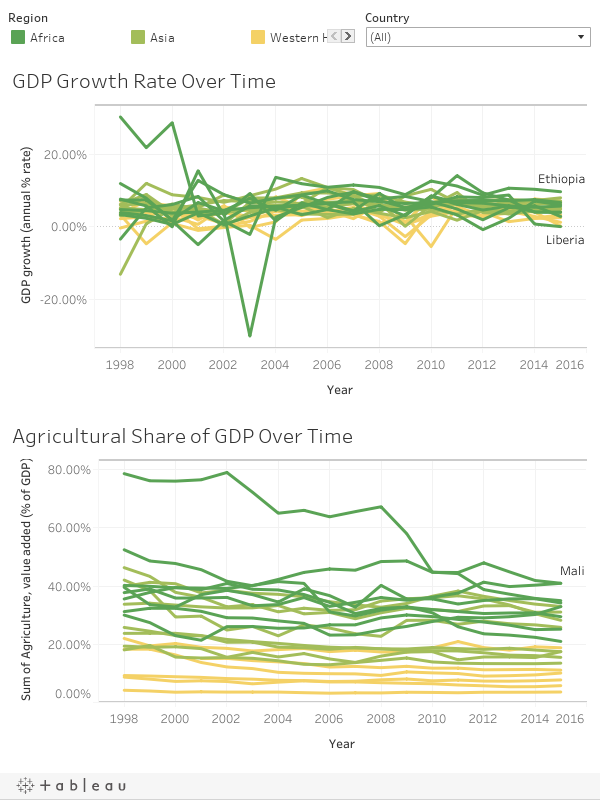 In these interactive graphs, each line represents growth rate over time in GDP or agriculture’s share of GDP for the past decade. Explore by clicking on the lines to highlight individual countries or use the tools to select groups of countries or regions to see how they compare. Go back, forward or start over with the arrows at the bottom. 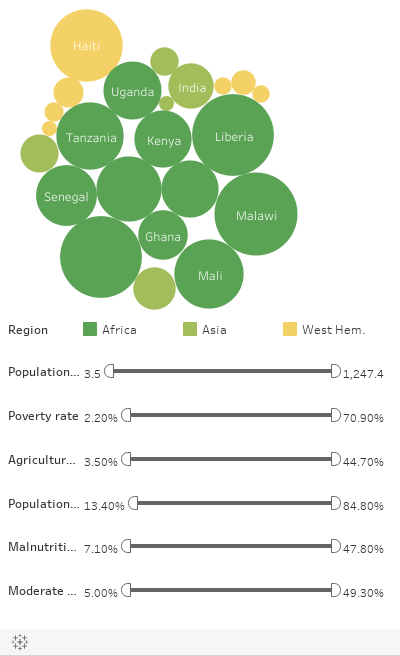 This tool shows just how important agricultural development is for a nation’s economy and its efforts to reduce poverty. In many developing economies, small-scale farmers produce the largest share of the nation’s food supply but also make up the largest share of the poor. Increasing small farm productivity can reduce poverty, improve food security and grow GDP, especially in countries with a large share of agriculture as is typical in sub-Saharan Africa. The lines also provide a simplified way to think about the impacts of local and global events. For example, the sharp decline in Haiti in 2010 could reflect the impacts of the 7.0 earthquake that devastated much of the country that year. For Kenya, a similar contraction in 2008 coincides with a major drought that affected GDP so heavily because of the nation’s large share of agriculture in the economy. In this interactive chart, each circle represents an AMA Innovation Lab project country by its relative poverty rate (% living on >$1.90/day). Hover over or click the circles to display related data. Toggle the sliders to compare countries by other data points. Go back, forward or start over with the arrows at the bottom.